The Industry’s Most Flexible Irrigation Controller Solution. 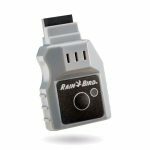 The newly enhanced Rain Bird® ESP-Me WiFi Compatible Controller offers legendary Extra Simple Programming, the highest station count in its class and new features so easy to use, you’ll actually use them. The ESP-Me WiFi Compatible Controller provides flexible scheduling features that make the controller ideal for all your irrigation controller needs. The controller boasts the industry’s largest LCD screen for its class and also incorporates universal icons on both the controller overlay and the LCD. 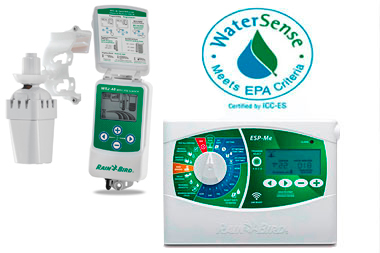 Make your controller SMART with EPA WaterSense® certification by adding the LNK WiFi module and a WR2 rain sensor – up to 30% water savings! 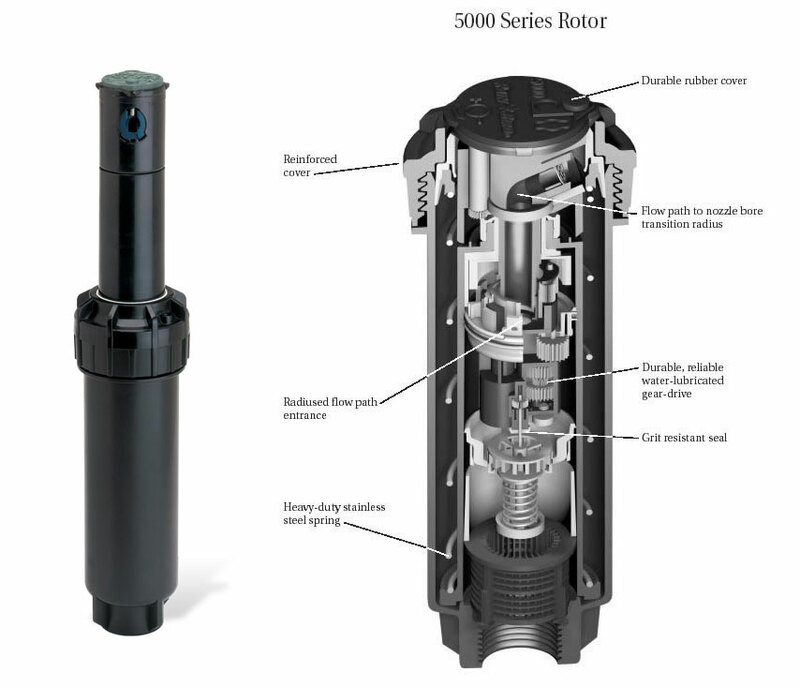 Relax with the knowledge your landscape is being watered by reliable 5000 Series Rotors and industry-leading Rain Curtain Nozzle Technology. 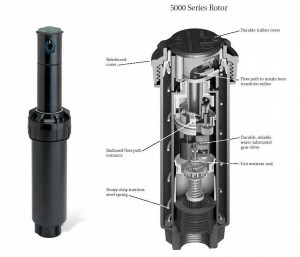 Rain Bird® 5000 Series Rotors are ideal for medium to large-size lawns and evenly distribute water from 25 to 50 feet. 5000 Series Rotors with Rain Curtain Technology are engineered to deliver a uniform spray pattern, giving you superior distribution uniformity and a consistently greener lawn with less water. Get even greater savings with optional in-stem pressure regulation (PRS). The larger water droplets produced by Rain Curtain technology prevent misting and airborne evaporation so the right amount of water is delivered to the right place, saving you water and money. Gentle close-in watering eliminates dry spots around the rotor, prevents seed washout and allows the turf to grow healthy with no matting or bending. Rain Bird Rotors set the standard for durability and reliable performance. There’s a Rain Bird Rotor for every application -low pressure, steep slopes, high wind, non-potable water, even vandalism. Choose Rain Bird Rotors. Get the results you seek. 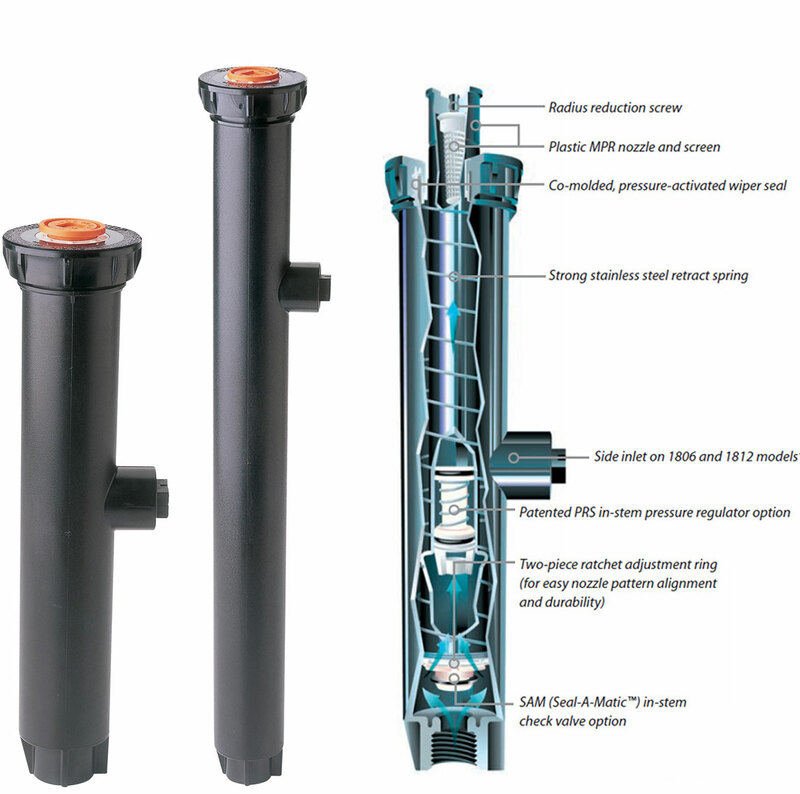 Rain Bird® 1800 Series Spray Heads and MPR Nozzles are installed by more contractors than all other brands combined. This worry-free combination distributes water evenly, ensuring a consistently green lawn. For some, the reason is a proven track record of performance that spans nearly three decades. Others praise the reliability and durability. Installed in parks and backyards across the globe, Rain Bird’s 1800 Series is the #1 commercial-grade irrigation spray head brand in the world. Chosen for its reliability, heavy-duty materials and versatility, the 1800 Series has first-rate quality built in for reliable operation and long life. Their superior components and features make them the spray heads of choice for a wide variety of applications.